The nuclear envelope is composed of two lipid bilayers, the outer nuclear membrane, which is contiguous with the endoplasmic reticulum, and the inner nuclear membrane. The inner nuclear membrane contains a variety of integral membrane proteins. Among the first inner nuclear membrane proteins identified were members of the LEM-domain family of nuclear proteins, which are named for LAP2, Emerin and MAN1. 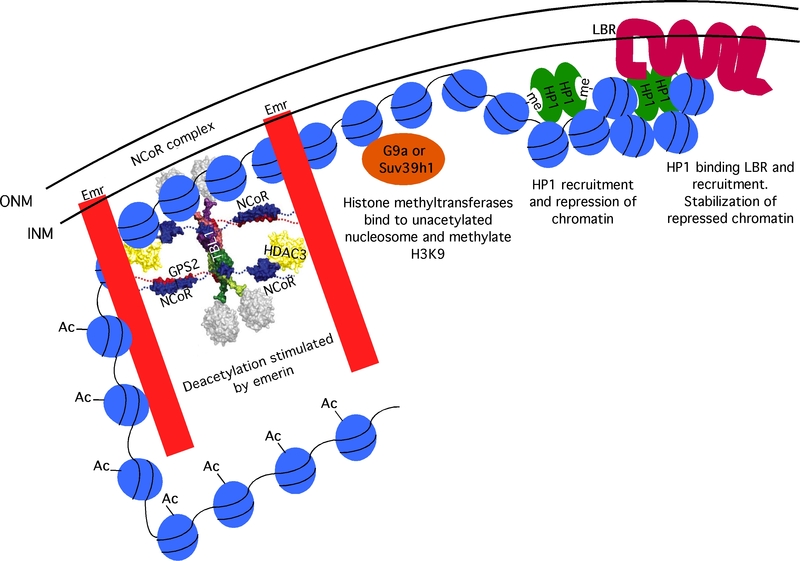 The LEM-domain binds directly to the chromatin-associated protein Barrier-to-Autointegration Factor (BAF). BAF is a small, essential protein with direct roles in higher-order chromatin structure, nuclear assembly and gene regulation. Emerin also binds directly to A-type lamins, which anchor emerin at the inner nuclear membrane. The lamins are nuclear intermediate filament proteins that form an inner nuclear membrane-associated lattice that gives the nuclear envelope its strength. Together, emerin and lamin A form many stable oligomeric protein complexes that regulate gene expression and nuclear architecture. Mutations in the genes encoding emerin and lamin A produce diseases with a broad spectrum of both overlapping and distinct phenotypes. These diseases, collectively called laminopathies, cause progressive skeletal muscle wasting, life-threatening irregular heart rhythms, contractures of major tendons, abnormal fat deposition and premature aging. Emerin and lamin A are expressed in nearly all differentiated cell types, yet mutations in these proteins cause diseases that specifically affect heart, skeletal muscle, tendons and fat. To explain the tissue specificity of laminopathies, emerin and lamin A were variously proposed to have roles in tissue-specific gene expression, cell signaling or nuclear architecture. Growing evidence supports roles for emerin in gene expression, as emerin binds directly to many transcription regulators. Further, muscle biopsies from both patients and mice lacking emerin show dramatic changes in many muscle regeneration pathway components, suggesting that proper expression of these genes requires emerin. Thus, we predict that emerin may be required for the regeneration of tissues affected in laminopathies. To address how emerin regulates gene expression, we are studying how emerin regulates the activity of a newly discovered transcription factor named Lmo7. Importantly, Lmo7 regulates the expression of critical muscle stem cell differentiation and is required for proper myogenic differentiation. We are also exploring how emerin regulates genomic architecture during myogenic differentiation. For these studies we are identifying the genomic regions that associate with emerin in muscle stem cells and how the association of these regions changes during myogenic differentiation. We are also characterizing the trans-factors that regulate chromatin repression and association of the genome with the nuclear envelope. Lastly, we are also examining the role of emerin and Lmo7 in regulating mesenchymal stem cell differentiation, since all the tissues affected in nuclear envelope-associated diseases are derived from the mesenchymal lineage.